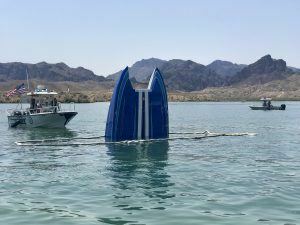 PHOENIX — Proper use of life jackets and an engine cutoff lanyard prevented the potential drowning of three boaters after their speeding boat flipped over on Lake Havasu on June 20. Deputies from the Mohave County Sheriff’s Office responded to an accident that ejected all occupants from a boat around 10 a.m. June 20 on Lake Havasu. The 36-foot Skater vessel was traveling at an estimated 80 to 100 mph and when the operator made a hard left turn, all three people aboard were ejected. The operator was transported to Havasu Regional Medical Center for a severe head laceration and the two passengers refused medical treatment for minor injuries, according to the Mohave County Sheriff’s Office. The U.S. Coast Guard reported that in 2016 there were 4,463 recreational boating accidents, involving 701 deaths nationwide. In cases where the cause of death was known, 80 percent of fatal boating accident victims drowned and of those, 83 percent were not wearing a life jacket. In Arizona, there were five deaths from boating accidents last year. The accident on Lake Havasu is a good reminder to ensure boating safety practices are in use by yourself and all passengers by always wearing a life jacket. Also check to ensure all life jackets are in good condition, that they are the right size and fit for your passengers. On average in Arizona, life jackets should be replaced every five years. Remember that state law requires that anyone 12 and under must wear a life jacket at all times when the vessel is underway and there should be one life jacket aboard for every passenger. And don’t forget that a throwable flotation device — usually a cushion with handles or a ring buoy — is required for all watercraft longer than 16 feet, except for canoes and kayaks. The Arizona Game and Fish Department also recommends that watercraft operators and their passengers take a free boating safety course in Phoenix and Lake Havasu City to learn the information and tips needed to stay safe while on the water.